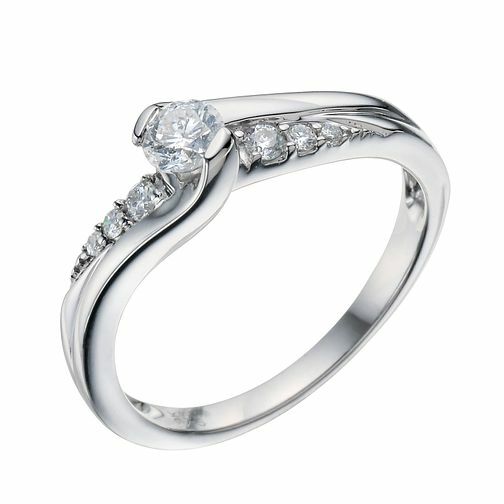 9ct White Gold 0.33 Carat Diamond Twist Solitaire Ring is rated 4.7 out of 5 by 18. Rated 5 out of 5 by Anonymous from Ring is Beautiful I bought the ring to replace a fake ring I wear and I love it! Admittingly, I would have loved to see a person wearing the ring before I bought it as it was smaller than I thought it would be, but it is very beautiful. Rated 4 out of 5 by Anonymous from Great looking piece A lovely delicate looking ring with a good sized stone set off nicely by the smaller stones leading up to it.